What is the Corporation for Public Broadcasting? The Corporation for Public Broadcasting (CPB) is a private, nonprofit corporation created by Congress in the Public Broadcasting Act of 1967. CPB receives federal funding from Congress and distributes the majority of funding to nearly 1,500 locally managed public radio and television stations across the United States. It does not produce programming or own, operate, or manage any public media broadcasting stations. CPB receives federal funding from Congress two years in advance, per the Public Broadcasting Act. Once received, CPB distributes funding based on a formula that is set in law. 18% is invested in the creation of the programming you enjoy and depend on. 6% is spent on system wide support including research, copyright fees and national initiatives. 5% or less covers CPB’s operations. CPB’s mission is to provide all Americans with free, over-the-air access to local public media, regardless of whether they live in an urban, suburban, rural, or remote area. Many rural communities rely on public media as one of their only sources of local media. In fact, 248 public radio and television stations serve communities that are often unserved by other local media services. Federal funding ensures that these communities have access to news, educational programming, public safety information, local culture and more. 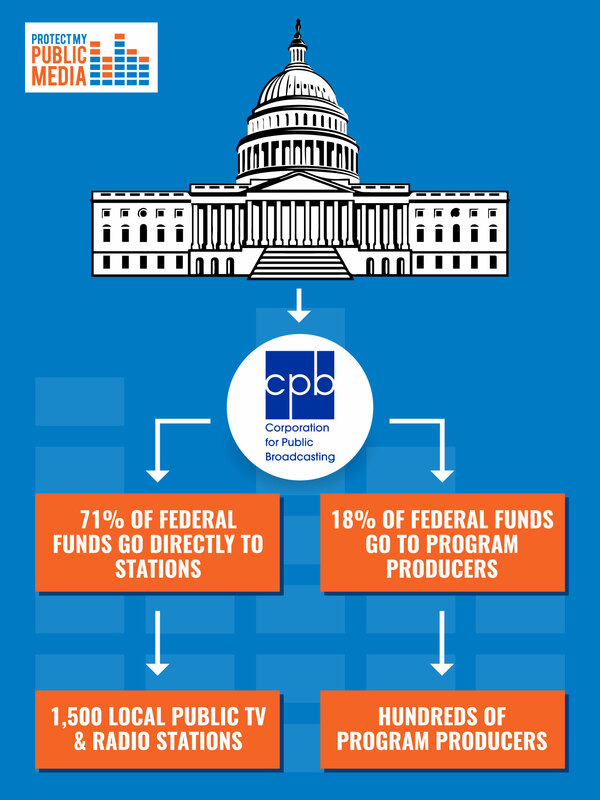 On average, stations raise $6 for every federal dollar they receive from CPB, resulting in a highly effective public-private partnership. Every year, we ask Congress to continue to fund CPB because studies show that there is no replacement for this funding. Without it, stations would be forced to cut programs and services, or – particularly smaller stations in rural areas – could even be forced to go off the air. Without federal funding, you would not have access to the same public media programs you enjoy today. Contact your lawmakers and remind them that public media like CPB is essential.